The risk of serious head injury (HI) from a fall in a young child is ill defined. The relationship between the object fallen from and prevalence of intracranial injury (ICI) or skull fracture is described. Method Cross-sectional study of HIs from falls in children (<6 years) admitted to UK hospitals, analysed according to the object fallen from and associated Glasgow Coma Score (GCS) or alert, voice, pain, unresponsive (AVPU) and CT scan results. Results Of 1775 cases ascertained (median age 18 months, 54.7% boys), 87% (1552) had a GCS=15/AVPU=alert. 19.3% (342) had a CT scan: 32% (110/342) were abnormal; equivalent to 5.9% of the overall population, 16.9% (58) had isolated skull fractures and 13.7% (47) had ICI (49% (23/47) had an associated skull fracture). The prevalence of ICI increased with neurological compromise; however, 12% of children with a GCS=15/AVPU=alert had ICI. When compared to falls from standing, falls from a person's arms (233 children (mean age 1 year)) had a significant relative OR for a skull fracture/ICI of 6.94 (95% CI 3.54 to 13.6), falls from a building (eg, window or attic) (mean age 3 years) OR 6.84 (95% CI 2.65 to 17.6) and from an infant or child product (mean age 21 months) OR 2.75 (95% CI 1.36 to 5.65). Conclusions Most HIs from a fall in these children admitted to hospital were minor. Infants, dropped from a carer's arms, those who fell from infant products, a window, wall or from an attic had the greatest chance of ICI or skull fracture. These data inform prevention and the assessment of the likelihood of serious injury when the object fallen from is known. Falls are a common mechanism in young children admitted to hospital with head injury. Most are minor head injuries but can be associated with morbidity from post-concussion syndrome. The likelihood of cranial or intracranial damage from different fall mechanisms is ill defined. Abnormal CT scans were identified in 5.9% of the children who had sustained head injury from a fall. The highest risk mechanism of fall for acquiring skull fracture or intracranial injury is an infant who is dropped from a carer's arms. These data have the potential to inform prevention to reduce the number of infants and young children who sustain head injuries from falls. The estimated proportion of childhood HIs caused by falls varies from 19%4 to 89%5 with many studies reporting figures between 50% and 70%.6–8 The prevalence decreases with age, with infants (<12 months of age) and very young children at the greatest risk.6 ,9 However, studies are based upon small sample sizes and broad age ranges. They often report falls from the ‘same level’ or from ‘an estimated height’. Some studies with a biomechanical focus do highlight the objects and furniture types involved in falls;10 ,11 however, small sample sizes prevent generalisation of these results. The Confidential Enquiry into Head Injury in Childhood was the principal project within the Centre for Maternal and Child Enquires (CMACE) in 2009. Data were collected from 90% of hospitals in England, Wales, Northern Ireland and the Channel Islands on children treated or observed in hospital inpatient areas. This large dataset provided the opportunity to describe the object fallen from, the neurophysiological status and CT scan findings in children younger than 6 years. All cases described as falls were extracted from the CMACE dataset of children younger than 6 years of age, admitted to hospital or who died at the scene or en route to hospital as a direct result of an HI between September 2009 and February 2010. Children admitted because of superficial or facial injuries were not included in the original dataset. Cases with insufficient data regarding the mechanism of injury, readmissions and those that were referred to social services for suspected physical abuse where there was uncertainty around the mechanism of injury were excluded. Cases that met clinical guidelines for a CT scan15 but where a CT scan had not been done were also excluded as we could not confirm the outcome. Data were collected for this cross-sectional study monthly in each hospital using predefined proformas (see online supplementary file 1) by a designated local coordinator. Data from completed forms were entered onto a secure database and duplicate cases were excluded. The child was classed as a hospital admission if they were admitted to a hospital inpatient setting for 4 h or more. The descriptions of falls were recoded using The European Union Injury Database Coding Manual.16 Incident place was coded according to home/private address, school/nursery, public highway/road/street/motorway other, unknown. Mechanism of injury: Falls were recoded as ‘Falls from standing or sitting’ and ‘Falls from a height’ and subcategorised according to falls from building, building component or related fitting, from person's arms, downstairs, from furniture, infant or child product or other. Object fallen from were initially categorised in accordance with the coding manual. These categories were then condensed down into six larger categories (see online supplementary file 2) with relevant subdivisions. The Glasgow Coma Score (GCS) recorded from the emergency department was the primary indicator of neurological status. When missing, the alert, voice, pain, unresponsive (AVPU) scores17 were used. These data were combined to create four categories—‘GCS=15/alert,’ ‘GCS=13–14’ ‘GCS=9–12/response to voice’ and ‘GCS ≤8/ response to pain or unresponsive’—as proposed by Mackay et al.18 (While Mackay et al refer to children older than 5 years, this was the best equivalence study available.) CT scan results were categorised as normal (no abnormality reported on CT scan), isolated skull fracture or intracranial injury (ICI) (injury to the brain or extra-axial structures) with or without skull fracture. Structural anomalies congenital defects and soft tissue injuries were combined with CT normal group. Two coders independently reviewed CT scan results and agreed the categorisation of injury mechanism and objects fallen from. HIs were classified as ‘minor’ if a CT scan was performed with a ‘normal’ result or no CT was performed but the GCS/AVPU score was GCS=15/alert. A descriptive analysis used proportions with 95% CIs. The logistic regression analysis (IBM SPSS V.20) was used to calculate the relative odds of sustaining a skull fracture or ICI from each mechanism to a fall from sitting or standing. A general model, including possible influencing covariates, namely mechanism of injury gender, age in years, was applied to the data and by a stepwise approach the statistically non-significant factors were removed from the model. To compare the accuracy of fit of the models, the software calculated fit statistics were used: (model) χ2, −2 log-likelihood, overall percentage—the overall per cent of cases that are correctly predicted by the model (IBM SPSS V.20). The best-fitting logistic model results are expressed as ORs, with 95% CIs. The original dataset included 5700 children (ages of 0–15). Of these, 60% (3423) were <6 years, 76.9% (2634) of whom presented following a fall. In total, 153 cases referred to social services with suspected physical abuse, 11 cases that met criteria for a CT but CT scan was not done and 695 cases with insufficient data regarding the mechanism of injury were excluded. This latter group of cases had the same distribution of age, gender, GCS/AVPU and abnormal CT scan results as the remaining 1775 cases available for analysis (figure 1). Age of 1775 children who were admitted to hospital after a head injury from a fall. The median age of the children was 18 months (IQR 30 months). There was an inverse relationship between age and number of children who sustained HI from a fall (table 1). A slightly greater proportion of HIs occurred in boys (54.7%, n=971) than in girls. A total of 1659 children had a GCS (1245) or an AVPU (414) recorded. Of the total population, 87% (1552/1775) had a GCS of 15 or were alert on AVPU. The length of stay was recorded for 1735 children. The median number of nights admitted was 1 (1005 children), 100 children were admitted for 2–4 nights, 8 for 5–7 days and 4 for more than a week, 616 were observed and sent home the same day. Two children died from their injuries. CT scan was performed in 19.3% (342). A significantly greater proportion of children aged 3–5 years (26.6% (95% CI 22.9% to 30.6%)) than children younger than 3 years (16.5% (95% CI 14.5% to 18.6%)) had a CT scan (table 2). Overall 68% (233/342) had a normal CT, 16.9% (58) had isolated skull fractures, 13.7% (47) had ICI (49% (23) of whom had an associated skull fracture), and 4 were reported as abnormal but details were not given (tables 1 and 2). 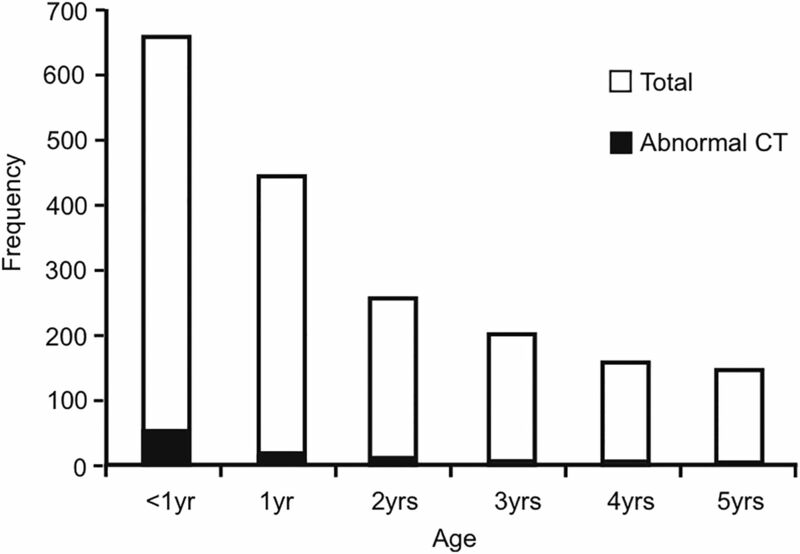 Children younger than a year had the greatest proportion of abnormal CT scans of 58% (58/100), 74.1% (43/58) of which were in children younger than 6 months of age. While the proportion of children with ICI increased with neurological compromise reflected by increased GCS/AVPU, ICI was identified in 12% (31/260) of children with a GCS=15/AVPU=alert who had a CT scan (table 2). Also, 62 of the 81 skull fractures were simple linear fractures (41 parietal/temporal, 6 frontal, 11 occipital, 2 basal, 2 location not recorded), 13 were complex fractures (5 bilateral and 7 depressed fractures, 1 multiple). In six cases, neither the site nor type was specified. There was no difference between the distribution of fracture type or site between the children who had coexisting ICI. Twenty-three children had fractures with ICI, in 22 there were underlying extra-axial haemorrhage, contusions were described in 2 cases and cerebral oedema in 1. In the 24 children with ICI but no skull fractures, the ICI included contusions (5), intracranial haemorrhage (3), extra-axial haemorrhage (15) and cerebral oedema (1). The majority (74.1% (1316/1775)) of HIs occurred in the home. Falling from a height accounted for 74.5% (1322/1775). Children who fell from a height were more likely to sustain skull fractures or ICI than those who fell from standing (7.4% (98/1322) vs 2.7% (12/453)). The calculated relative OR of this relationship was 2.9 (95% CI 1.6 to 5.4). There was a relationship between the age of the children and the mechanism of injury; young babies fell or were dropped from a carer's arms, toddlers who fell down the stairs or from furniture had a median of 18 months, 1 year olds fell from an infant product while the older children fell from standing or from walls, windows, shopping trolleys, and so on (table 3). The three mechanisms with the greatest proportions of abnormal CT were falls from (1) a person's arms, (2) building or building component (11 from a wall, 19 from window, 6 from attic, 6 balcony/banister/gallery/stage, 6 from bathroom furnishings or gate, 3 from patio) and (3) an infant or child product. Stepwise elimination of co-covariates in the logistic regression model resulted in only the mechanism of injury remaining in the model. The relative ORs for sustaining a skull fracture or ICI were significantly greater than a fall from standing or sitting, namely 6.94 (95% CI 3.54 to 13.6), 6.84 (95% CI 2.65 to 17.6) and 2.75 (95% CI 1.36 to 5.65), respectively (table 3). A child who fell from a carer's arms down the stairs had a greater chance (23.3% (95% CI 13.2% to 37.8%) (10/43)) of sustaining a skull fracture or ICI compared with those who were dropped on to the floor (14.2% (95% CI 10% to 19.9%) (27/190)). Figure 2 outlines the reported objects that 1775 children had fallen from. 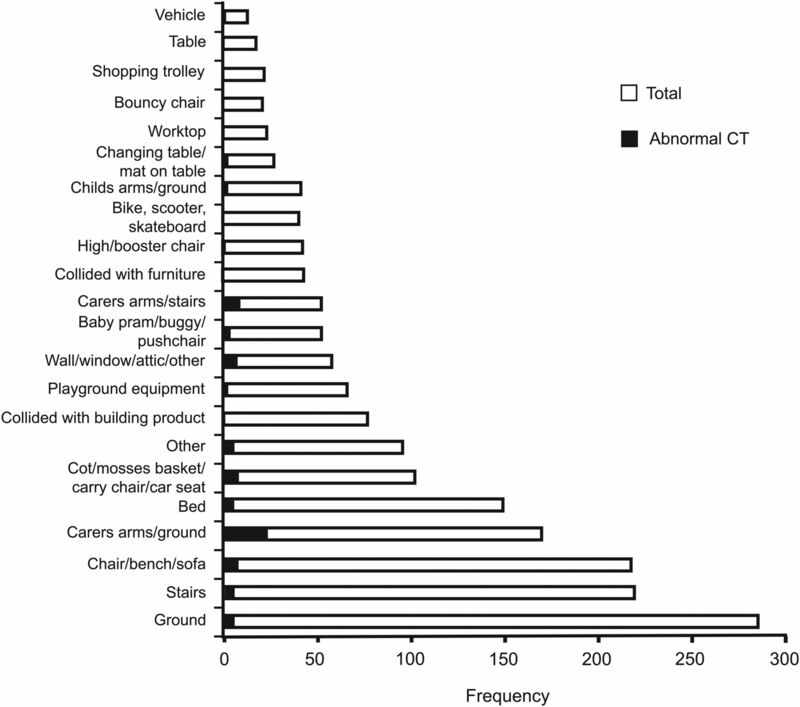 With the exception of falls from a carer's arms, from a building or an infant child product, there were no significant statistical differences in the proportion of abnormal CT findings among any of the other categories. Object fallen from for 1775 children admitted to hospital with a head injury from a fall. The greatest proportion of the children who were admitted to hospital following an HI from a fall were younger than 1 year. One-fifth of the children had a CT scan to confirm or exclude ICI. One-third of which had an abnormality reported, equivalent to 5.9% of the overall population studied. The most common abnormal finding was a skull fracture, most commonly a simple linear parietal fracture, a proportion (1 in 4) of these had an underlying extra-axial haemorrhage. Few children sustained an ICI without skull fracture. These findings are similar to those of Dietrich et al19 and to a recent publication by Thomas et al20 for children younger than 2 years old. The latter study identified ‘isolated skull fractures’ in 19.5% of children who had neuroimaging for head injuries and focal intracranial haemorrhage in 15.4%. Although the study included all mechanisms of injury, 82% of the series were from falls. The highest rate of abnormal CT scans was evident in infants who fell from a parent's arms, a finding consistent with other studies.5 ,21 ,22 The likelihood of an abnormal CT scan was greater for children dropped on the stairs compared with those dropped on to the floor. By contrast, falls down stairs, which were one of the most common reasons for hospital admission, resulted in a low prevalence of skull fracture or ICI. Much of the information processed and coded was written in free text, creating an element of subjectivity when categorising data. The data had been collected from >200 hospitals, and the quality of data entry varied. However, after exclusion of cases with poor data quality, we are confident that the dataset represents a cross section of falls in preschool children who were admitted to hospital. Although the Injury Database manual was used as a coding standard for consistency, the manual is not designed specifically for falls and was thus adapted for the population studied to include some of the emergent categories. The increased likelihood of a skull fracture or ICI from a fall from height compared with falling from standing height was unsurprising. The height of a fall in this study was estimated in terms of the nature of the item fallen from, and this is frequently all that the clinician has to inform a clinical assessment when assessing the likelihood of cranial or intracranial structural damage. Estimating a fall height threshold for serious HI is a debated topic.10 ,13 ,23 ,24 In 1991, Williams described how infants who fell from <10 ft (3 m) were unlikely to sustain serious injuries (intracranial haemorrhages, cerebral oedema, depressed skull fractures and compound or comminuted fractures),23 while in 2008 Chadwick et al13 published a systematic review estimating a mortality rate of <0.48 deaths per one million children in the USA for children involved in short falls of <3 ft (<1 m). In 2012, Ibrahim et al10 acknowledged that falls from a greater height could result in incrementally more serious injury but suggested that there are multiple factors to consider such as the angle of the fall, impact and landing position of the child (all beyond the scope of this study). Although we were unable to make height estimates, our results show a lower proportion of skull fractures or ICI after a fall from standing or from low-height furniture than from falls from windows and other building components, or from a carer's arms. This study extends our understanding of HI from falls and the risk of skull fracture or ICI given the age of the child and item fallen from. It identifies the dangers of dropping children while confirming that low height falls, including simple stair falls, rarely cause impaired consciousness, skull fractures or ICI. The findings have the potential to inform HI clinical decision rules about falls that warrant a CT scan. Currently, this varies from a fall of 3 ft or more or five stairs (Canadian Assessment of Tomography for Childhood Head Injury),28 falls that exceed 0.9 m for children younger than 2 years or >1.5 m (5 ft) for older children (Pediatric Emergency Care Applied Research Network)1 to falls that exceed 3 m (Children's Head Injury Algorithm for the Prediction of Important Clinical Events).29 Child protection specialists can apply the findings to inform decisions about the plausibility of injury explanations when assessing infants and young children with suspected physical abuse. Prevention initiatives should stress the importance of carrying children safely, particularly while going up and downstairs. This project/audit is commissioned by the Healthcare Quality Improvement Partnership (HQIP) as part of the National Clinical Audit and Patient Outcomes Programme (NCAPOP). This is one of a series of forthcoming publications using the study data.
. Admitted Patient Care, England, 2011–12: External causes 1 November 2012 ed. 2012.
. Longitudinal neuropsychological outcome in infants and preschoolers with traumatic brain injury. J Int Neuropsychol Soc 1997;3:581–91.
. Brain injuries among infants, children, adolescents, and young adults. Am J Dis Child 1990;144:684–91. NICE. Triage, assessment, investigation and early management of head injury in infants, children and adults. National Institute for Health and Clinical Excellence, 2007. European-Union. The Injury Database (IDB) coding manual: data dictionary. Amsterdam, The Netherlands: Consumer Safety Institute, 2005. Trauma ACoSCo. Advanced life support manual. Chicago: American College of Surgeons, 1993.
. Association between the assessment of conscious level using the AVPU system and the Glasgow Coma Scale. Pre-Hos Immediate Care 2000;4:17–19.
. Head injury in very young children: mechanisms, injury types, and ophthalmologic findings in 100 hospitalized patients younger than 2 years of age. Pediatrics 1992;90(2 Pt 1):179–85.
. Stairway injuries in children. Pediatrics 1988;82(3 Pt 2):457–61. Collaborators Additional members of the original CMACE Head Injury External advisory group: Professor Robert Tasker, Paediatrics, University of Cambridge, Dr Rosemary Arthur Consultant Paediatric Radiologist Leeds (British Society Paediatric Radiology), Dr Fiona Lecky: Research Director TARN, Senior Lecturer, Honorary Consultant Emergency Medicine Manchester, Dr Fiona Moore: Medical Director London Ambulance Service, Dr Kevin Moore: Director PICU Birmingham Children's Hospital. Lisa Turan: Chief Executive Child Brain Injury Trust, Girkamal Virdi: Assistant Head of Clinical and Audit Research London Ambulance Service, Mark Woolcock: Emergency Medical Practitioner and Emergency Specialist Service South Western Ambulance Service NHS Foundation Trust, UK. Contributors PB undertook this project as an intercalated medical student when completing his BSc in Public Health. LT undertook and advised upon the statistical analysis. RH designed the original data collection tools, supervised data collection, cleaning and data entry of the data collected within the original confidential enquiry of head injury (CMACE). JH gave supervisory advice to PB, advised on biomechanics and participated in study design and analysis. GP was the director of the CMACE confidential enquiry and supervised the design and running of the project and has been involved in editing his manuscript. RJE, PH, IM and RCP were all members of the project Independent Advisory Board and gave advice and editorial supervision at regular intervals during the study analysis. AMK supervised the student project, coordinated the study writing, checked and edited the manuscript, agreed the concept and methodology of this particular analysis. Funding Health Quality Improvement Partnership. Competing interests IM is supported by the National Institute for Health Research (NIHR) Biomedical Research Centre based at Imperial College Healthcare NHS Trust and Imperial College London. Patient consent CMACE obtained Section 251 approval to gather patient information without consent. Ethics approval The project was approved by the Central Manchester Research Ethics Committee. R&D or clinical governance approvals were obtained from all participating hospitals. These approvals were renewed when the project was transferred to Cardiff University for analysis (Ref 09/H1008/74) July 2012. Data sharing statement The data that informs this study is an anonymised national dataset and is available upon request for individuals who have a worthy cause to analyse as long as the rationale fits with the ethical approval and Section 251 requirements. We would consult with such bodies as necessary.